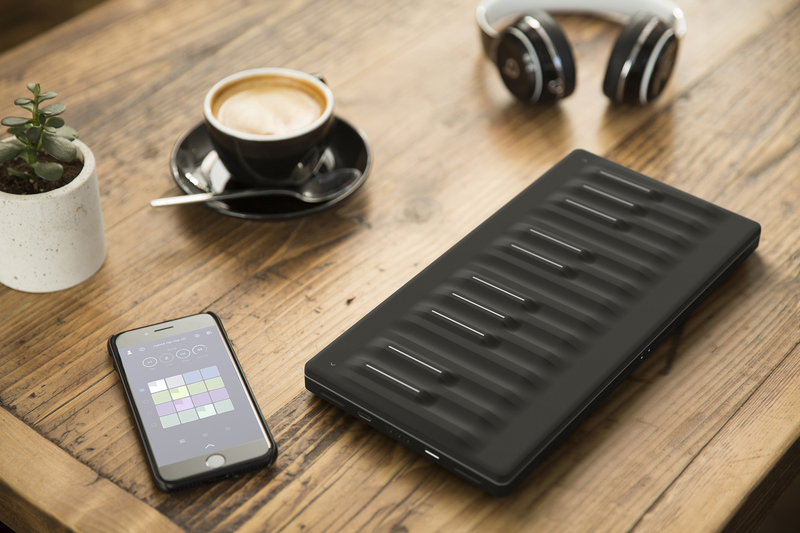 In its short existence as a startup, London-based Roli has created two of the most compelling music-making devices in recent memory. The Seaboard was a material rethink of the standard electric keyboard, with a rubbery surface that allows played notes to be manipulated directly in a variety of ways. And the company went in an altogether different direction last year with Blocks — a system of square music pads with playable light-up scales that can be arranged in any number of configurations. So, why didn’t it just announce the Seaboard alongside the first Blocks? The short answer is that the miniature version of its rubbery keyboard just wasn’t ready in time. In fact, the version that I saw last week still wasn’t final. Now that it’s here though, it may go a ways toward helping users wrap their brains around precisely what the whole Block system is about. After all, at least the Seaboard’s familiar piano layout offers a starting point to contextualize music making. Its equivalent of black and white keys make a lot more sense than a light-up square the first time you look at it. On the flip side, this also is far and away the most affordable version of the Seaboard the company has offered up, at $299, versus somewhere between $799 to $8,888. Granted, it has fewer keys (24) and features than the full-size version, but modularity means that you can pair it with any number of controls or make it larger by snapping together Seaboard Blocks ad infinitum. And let’s be real, as much buzz as the Seaboard has gotten over the past couple of years, a $799 starting point is prohibitively expensive for most. Particularly with a relatively unproven product. Roli showed me a demo of the Seaboard last week, plugged into various Blocks in all sorts of configurations. I don’t really play the piano, so I wasn’t able to do much with the thing, but the system the company is building here is really impressive — and will likely get better as it continues to grow. The amount of sounds it is capable of producing is staggering, and the sky is the limit when plugged into its music making apps, Noise and the new Equator. There are no specific numbers, and there are obviously a few qualifiers, but it’s understandable that the product might have a bit of a slow ramp up, all things considered. Though, a front of store placement in various Apple Stores around the country helped in getting the devices into more users’ hands. This time out, Roli won’t be receiving that killer product placement, but it is planning to launch short instructional videos to help remove some of the mystery from the devices.